I know, I know you’ve already seen the handsome visage of Sr. Romero, but really, how can I resist this cute pose of my Little Darling? 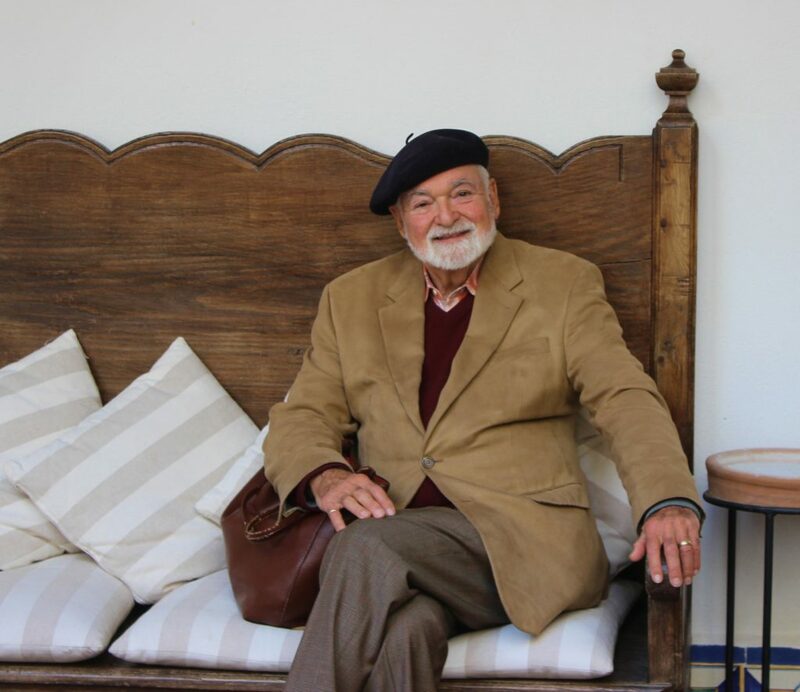 We were checking into The Casa Imperial Hotel in Sevilla and I caught him ready to roll and see that wonderful city literally pulsing with tempting delights. But first a few pictures of our hotel which was a humdinger and once again deserving of the, “Ay Caramba!” exclamation. 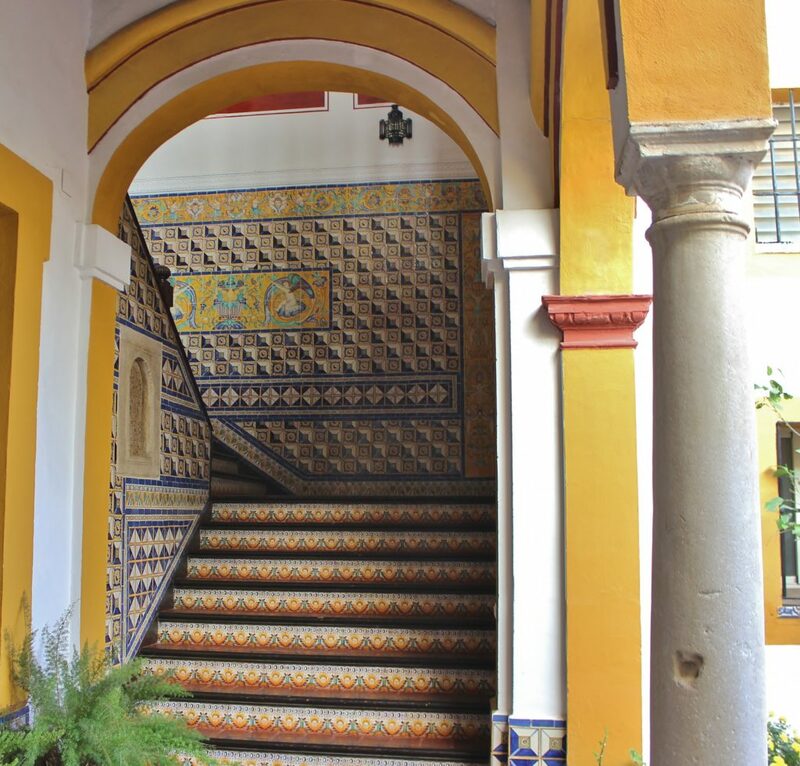 The main staircase of Casa Imperial is tiled with a cheerful array of colorful patterns on the steps and running up the walls with figurative panels inset at the middle landing. 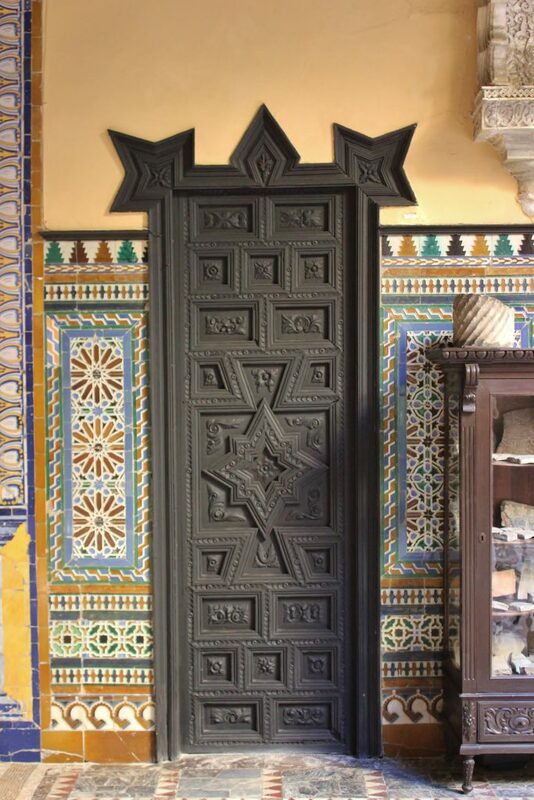 These designs are typical of the Mudejar style mixing the Moorish and Christian influences that blended after the reconquest of Spain. The early history of Casa Imperial is not documented but structural evidence places the construction date about the mid-17th century, somewhere around 1650. The four patios that meander back from the surprisingly narrow entrance façade are divided by “screens” of marble pillars and enticing hallways leading to the next open space where delicate fountains fill the quiet with the calming trickle of water. Each courtyard patio has two levels surrounded by suites of rooms that open onto the central spaces. The gardens are filled with neatly trimmed fruit trees and potted flowers. Along the covered walkways surrounding the gardens comfortable seating furniture is grouped and interspersed with antique wooden chests that hold the household linens used in the guestrooms. On the second floor of the middle patio cloister, a mysterious hallway leads to a narrow set of steps guarded by ancient wrought iron banisters with fancy grillwork. 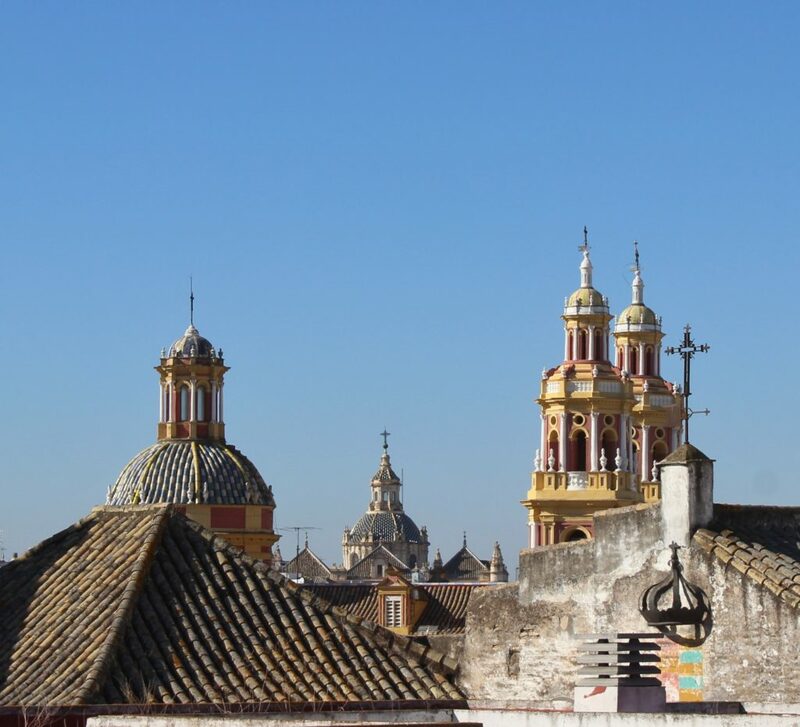 From this passage you can ascend to the roofs of Casa Imperial from whence you can see the surrounding church steeples and roofs of the town. 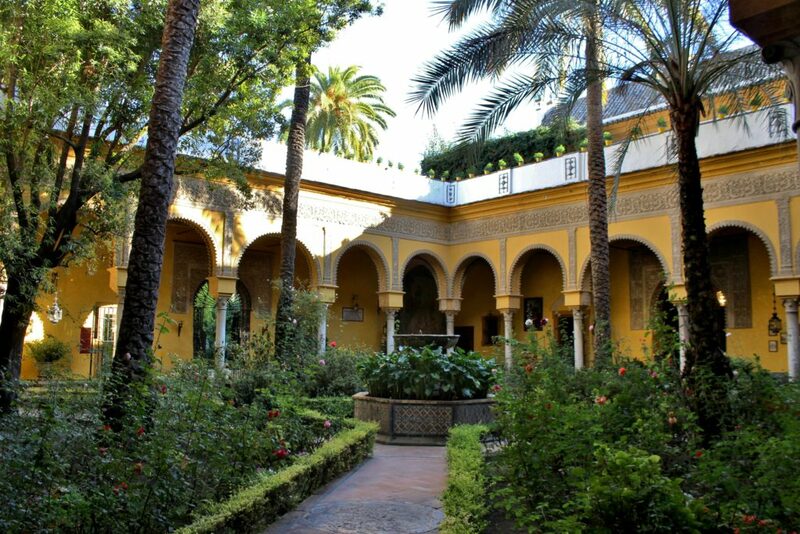 Sevilla is a city of sumptuous surprises in the form of palace museums. Here we are at the front gate of, “Palacio de las Dueñas” The palace name derives from the monastery of Santa María de las Dueñas, which in 1248 sheltered the nuns and servants of Alfonso X. Today it is the Sevillano residence of the 19th Duque de Alba and before him its most memorable Dueña was his mother the celebrated Cayetana Fitz-James Stuart, 18th Duchess of Alba who was the most titled aristocrat of Spain, Europe and the world in her era (1926-2014) and one of the country’s richest individuals. In the Duchess’s later life she became infamous for her two marriages to younger men, first to a defrocked Jesuit priest who had been her confessor and then after his death to a businessman 24 years her junior. As a result of excessive plastic surgery she presented an alarmingly messed up visage that one would not want to meet inadvertently all upon an afternoon. Despite this loss of face the old broad was beloved by the populace who would call out, “Ole!” in response to her trembling Flamenco dance maneuvers of later years. 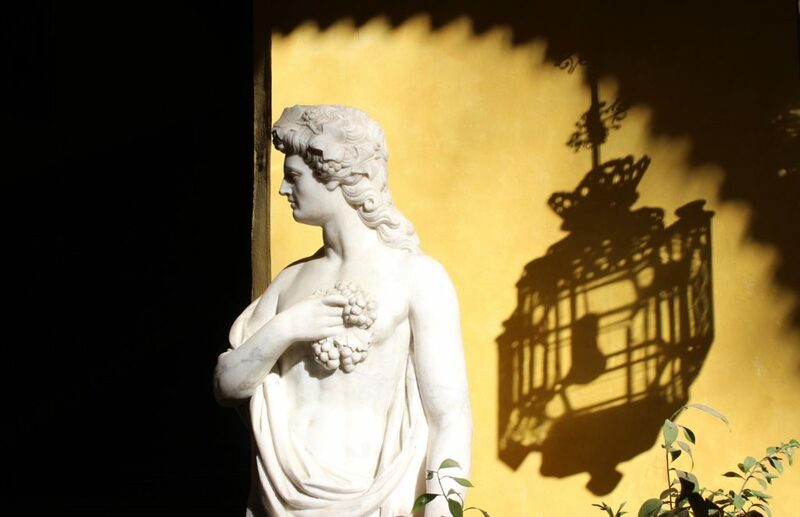 In a corner of the main courtyard of Las Dueñas this handsome marble statue of Bacchus is brilliantly lit by the afternoon sun that also casts a clear shadow of a hanging lantern and crenulated arch. 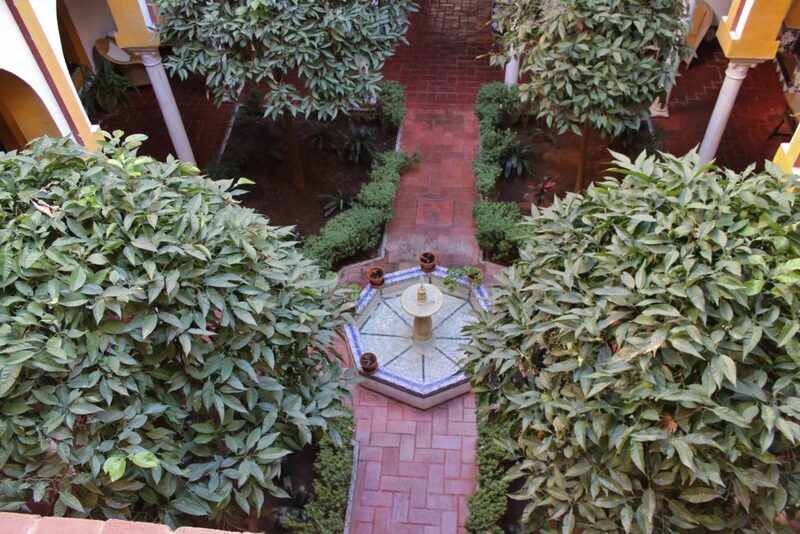 The main courtyard of Las Dueñas is planted with beautiful roses beneath palm and ficus trees with a tiled fountain sounding a trickle of water from a marble bowl. This is the “gypsy” dancer the room is named for. 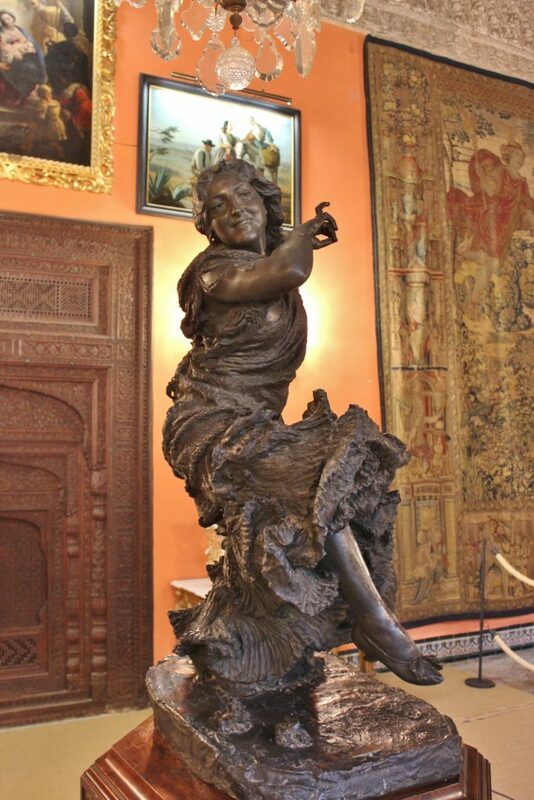 Here we see, “Pinrelitos” a bronze statue by Mariano Benlliure, 1909, of a young “Bailaora” or flamenco dancer from Cádiz. Pinrelitos looks a lot more cheery than most flamenco dancers I have seen who tend toward the impassioned heart rending agony of emotional turmoil that a gypsy “outsider” can express with authenticity- free of the restraints of propriety. I have read that Mariano Benlliure was a friend to Duchess Cayetana’s father. I do not know when this statue came to be in the collections of Palacio de las Dueñas or who purchased it. I suspect that several other sculptures of the palace that caught my eye are also by Benlliure because of their mischievous and dynamic revelry. In all of these sculptures there is an iconoclastic “twinkle in the eye” of the bon vivant that reflected or perhaps inspired the character of Duchess Cayetana who was an avid fan of flamenco dancing and bull fights. This is the quality that endeared her to the public as when on the occasion of her third wedding when she was 85 she slipped through the front gates of Las Dueñas where the ceremony took place and entertained the crowd with a brief impromptu flourish of Flamenco dance. Putting aside her venerable age and exalted title of Spanish Grandee, the most daring part of this performance was her completely ravaged face distorted by excessive plastic surgery. But judging by the warm applause of the assembled audience on the street, apparently what everyone saw was the indomitable spirit of a woman way beyond the restrictions of Spanish formality, so phooey on you Philip II and all your dour decorum. 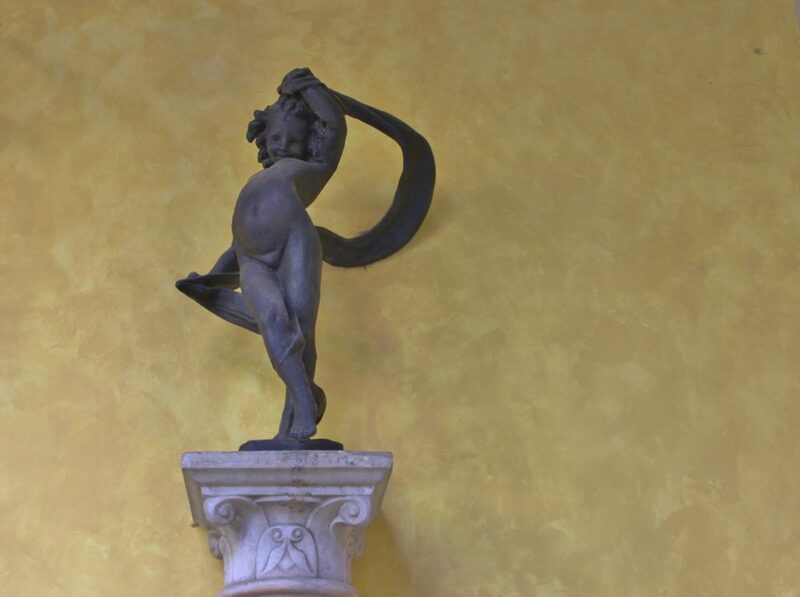 And here is a daring little darling held high on a marble pillar gracing the cloister of the main patio. I wouldn’t be a bit surprised to learn that it is also by Mariano Benlliure who included various rascally babies in his oeuvre. More to my point, here I feel the palpable presence of Duchess Cayetana permeating Las Dueñas as expressed in this brazen baby tripping the light fantastic and having a dammed good time in the process! This is a corner of the library of Las Dueñas with comfortable seating furniture and book cases stuffed with a collection of volumes both antique and contemporary. The palace is very much a lived in home with collections of bibelots decorating all available surfaces, some precious and some simply charming. 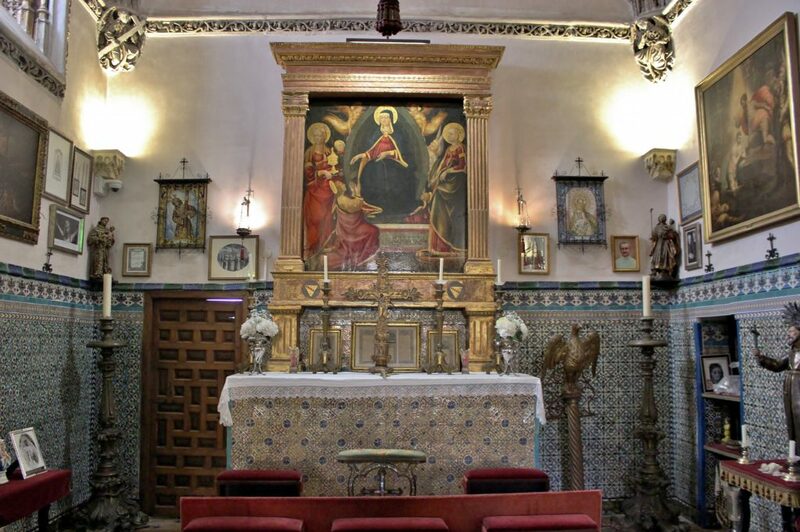 This is an intimate view of the private chapel of Las Dueñas. The walls are half covered with Mudejar tiles of lush colors incorporating the coppery iridescent glaze that adds depth to the overall impression. 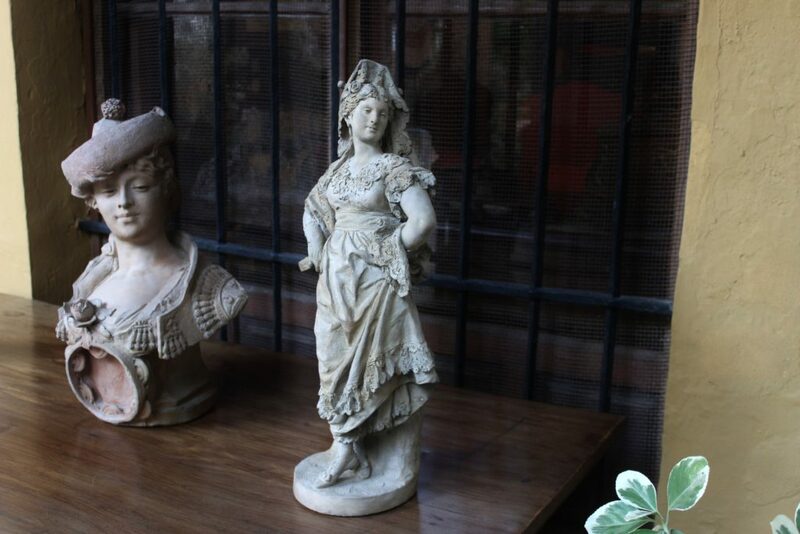 On a table protected beneath the cloister surrounding the main patio these two sculptures reference both bull fights and Flamenco dancing, two of Duchess Cayetana’s great enthusiasms. The jacket of the Maja on the left is recognizable as a matador’s chaquetilla or short jacket and along with her cap tilted at a rakish angle she presents the saucy attitude of a gypsy dancer with her tambourine and rose pinned to her breast. Leaving Las Dueñas, we wandered the streets of Sevilla and came across an area of fashionable shops displaying glamourous wedding gowns. 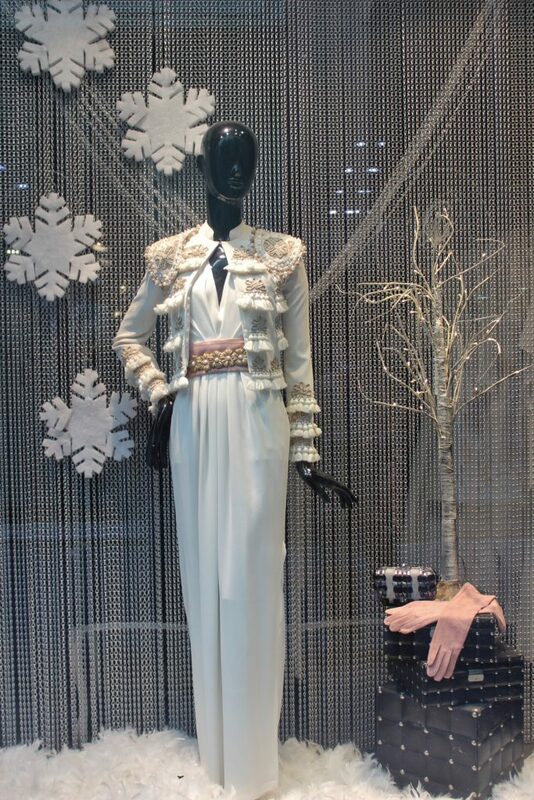 Here we see a supremely chic evening ensemble with a variation of the matador’s chaquetilla as an evening jacket, proof of the abiding fascination for Traje de Luces (suit of lights) referring to the sparkling “bling” created by the reflective sequins and gold braid of the traditional matador’s costume. 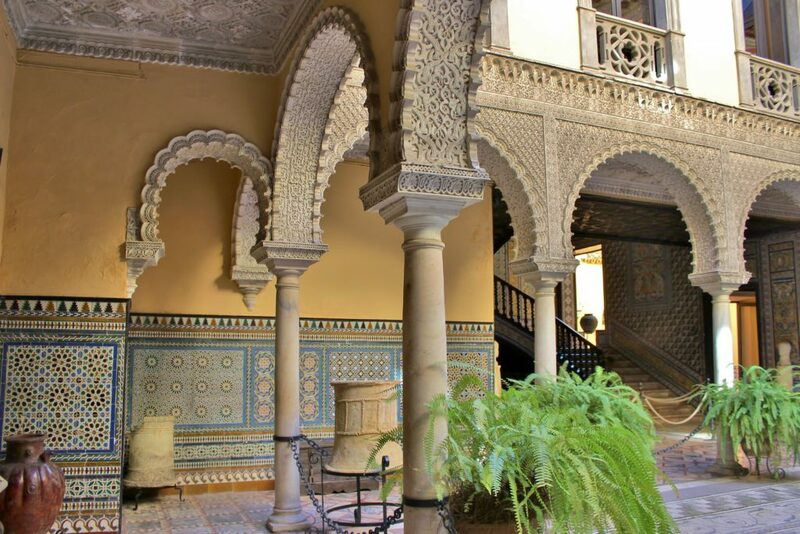 A little further on, at 8 Cuna Street we came across Palacio de la Condesa de Lebrija, a gem of Mudejar Renaissance revival style embellishing an original 16th century palace. Doña Regla Manjón y Margelina, Condessa de Lebrija bought the palace in 1901 three years after the death of her husband and spent 13 years renovating and installing her collections of archeological and architectural artifacts including a large display of ancient Roman floor mosaics which were primarily from the ruins of Italica an ancient Roman town near Sevilla. Condesa Lebrija collected many other ancient artifacts from Rome, Greece, Persia and China that are displayed in handsome cases around the rooms and hallways of the first floor of the Palace. Doña Regla Manjón was granted the title of Countess of Lebrija in 1912 in recognition of her abundant cultural and charitable work. She was a scholarly person who loved and collected books all her life. 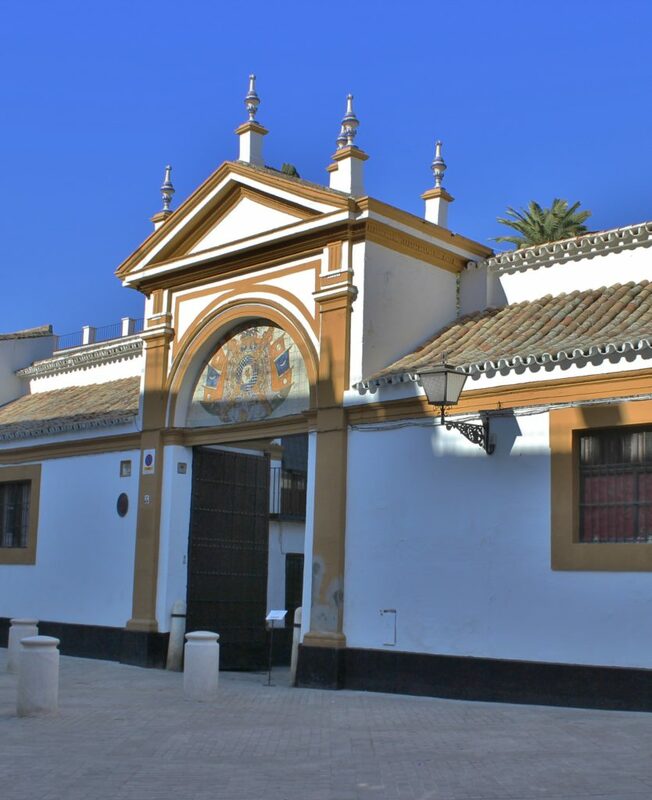 She and her husband Federico Sánchez Bedoya, who had been the mayor of Sevilla, amassed a considerable library of over 6,000 volumes including the historical archives of their respective families which The Condesa accommodated in an impressive library at Palacio Lebrija. In 1931, when the Condesa was suffering from failing eyesight she donated the major part of her library to the University of Seville. 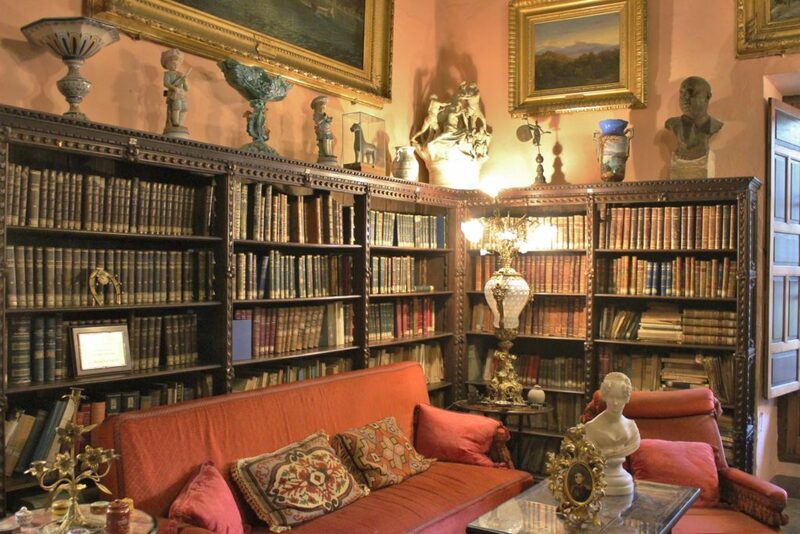 She and her husband also collected fine and decorative art and those collections are displayed in the sumptuous second floor private apartments also open to the public by guided tour. 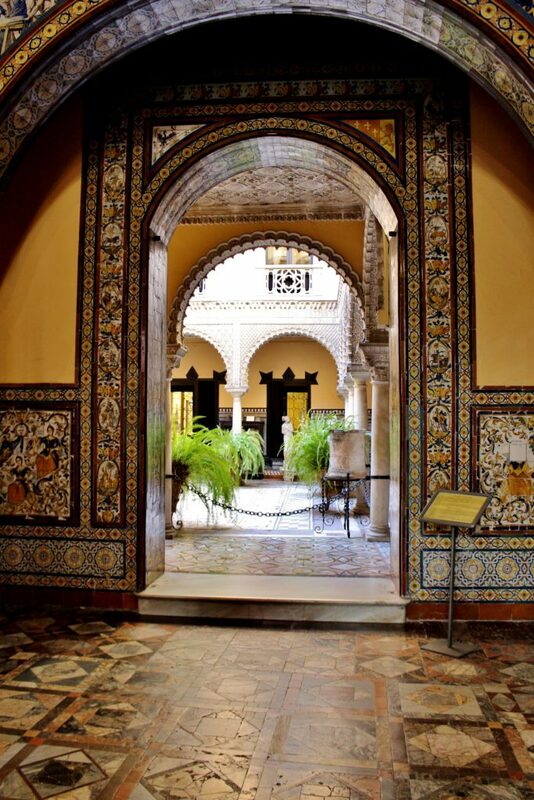 I think that it is a telling detail speaking volumes about Condesa de Lebrija that she decorated the front entrance of her palace with an ensemble of tiles that incorporate vignettes of women as artists practicing the fine arts and letters. Above we see an attractive and apparently competent young woman practicing the fine art of “La Escultura” or sculpture. In the four spandrels of the two arches in the vestibule one can see, sculpture, painting, music, poetry. These women are definitely not muses of the arts inspiring male artists but rather they are the artists themselves practicing the noble arts. It is my supposition that Condesa de Lebrija who was an educated and creative person in her own right intended to send a message of her pride in the valuable contribution of women to the cultured world. 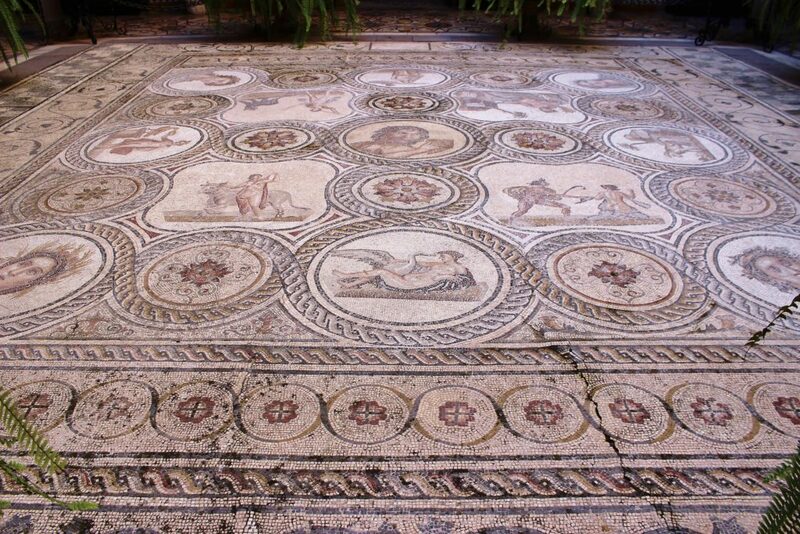 This is the mosaic floor of the central patio of Palacio de Lebrija. It was created in the 3rd century BC and is from the ruins of Italica an ancient Roman town near Sevilla. The god Pan is at the center with pictures of the various amorous exploits of Zeus surrounding. It was found in an olive grove close to the Italica forum and reassembled at the Palacio in 1914. This is a corner of the main patio of Palacio de Lebrija. The elaborate Mudejar carved stucco work decorating the arches is characteristic of Andalusian Spain and provides endless material for close examination to trace the elaborate designs. The equally complex geometric patterns and sumptuous colors of the tiled wainscoting provide lively color to the overall design scheme. An unusual ingredient in the collection are the terracotta wellheads scattered about the periphery of the patio, each one has a unique wrought iron stand. Here we see a corner of the main patio showing one of the fanciful doors that contrasts dramatically against a festival of textures, patterns and colors. The detailing on the custom made display cabinets complement and enhance the collections within. I especially appreciated the fragment of a diagonally fluted pillar sitting on top of the cabinet. 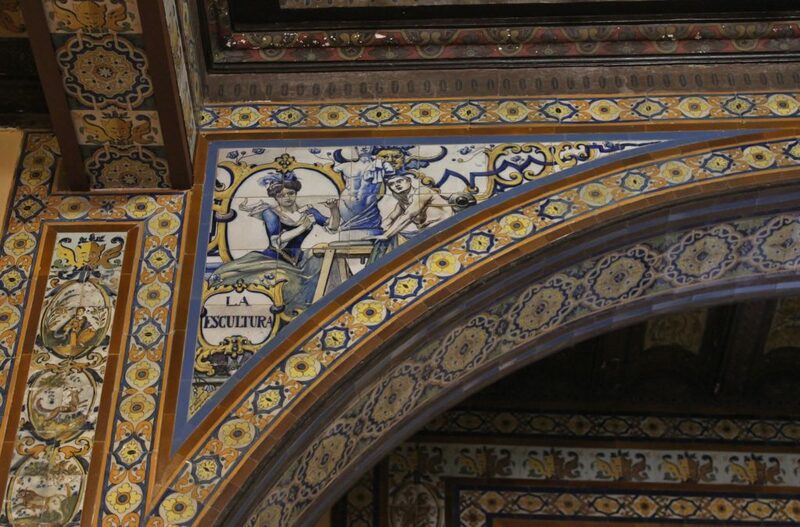 This is an example of the thoughtful arrangement of the art and artifacts in the Palacio de Lebrija. Even though each component part enjoys its own complexity of design the individual pieces are arranged to exhibit their own importance and intrinsic beauty. 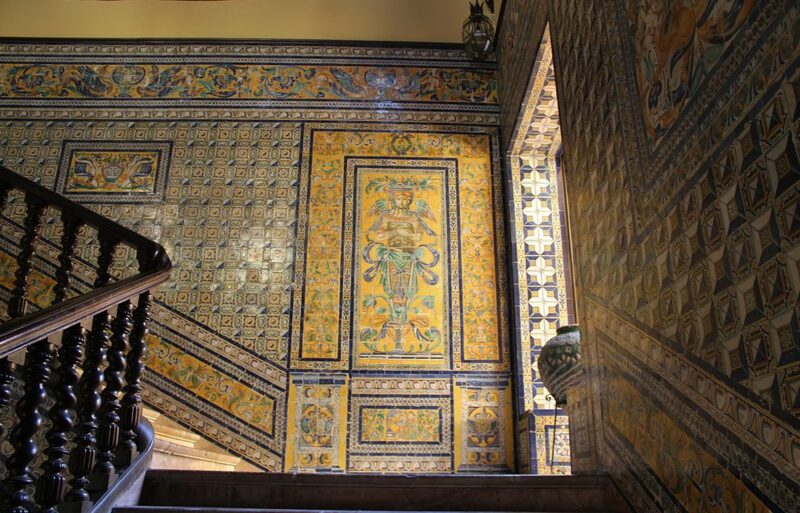 The landing of the grand staircase is lavishly decorated with tiles rescued from a 16th century ruined convent. 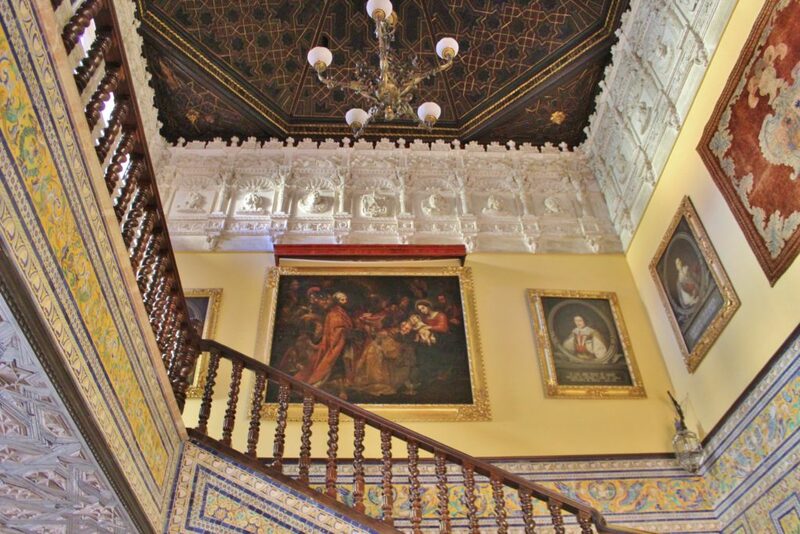 The proportions of the staircase are immense and also includes a carved renaissance frieze with portrait busts and above that a soaring antique ceiling in Mudejar style. 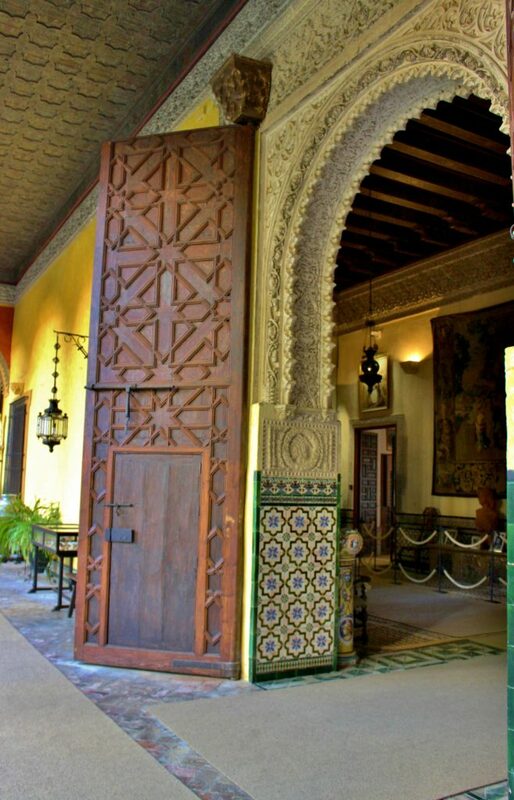 These important architectural elements were from other palaces and incorporated into the Lebrija by La Condesa. 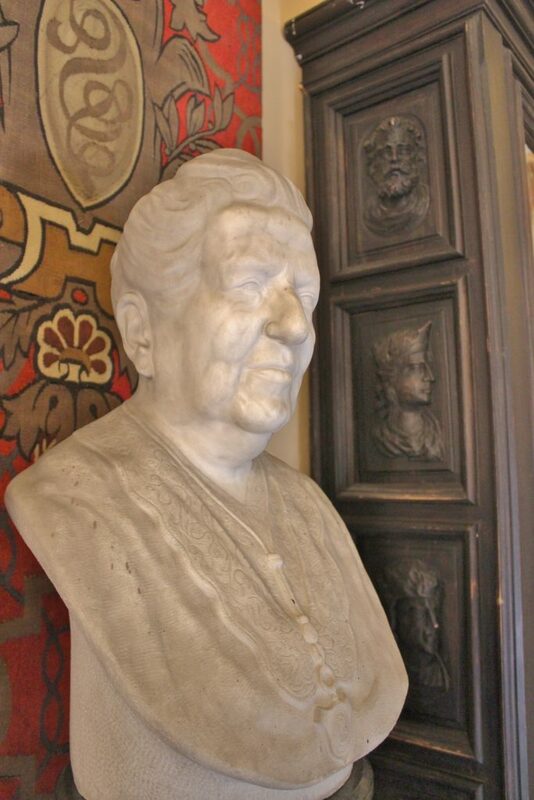 Here is a marble bust of La Condesa de Lebrija with a lineup of antique dignitaries gracing an adjacent cabinet keeping her company. Would it be irreverent for me to say that she reminds me of Gertrude Stein? In my defense they were both imposing women collectors at more or less the same time although of vastly different tastes and interests in art. 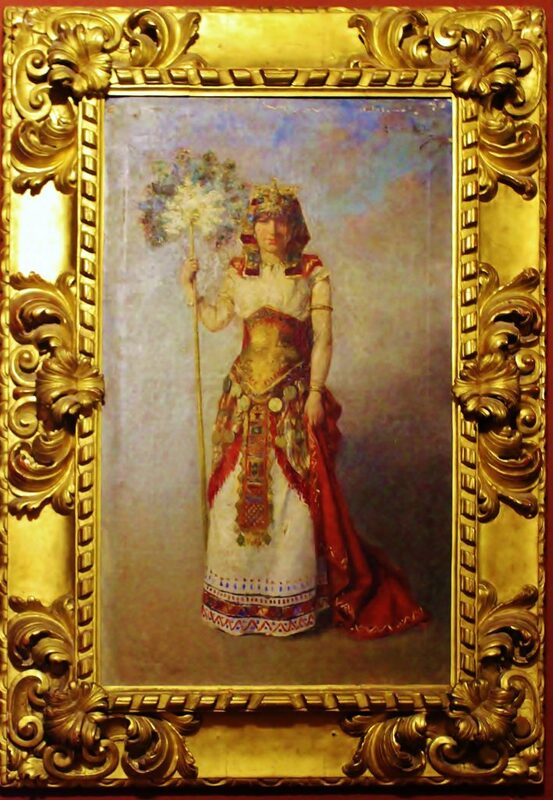 La Condesa de Lebrija as a younger woman in the costume of Cleopatra at a fancy dress ball. Now, my regular readers know that I am a sucker for fanciful pageantry and this portrait is a wonderful example of what to wear at a grand bash. Right on Condesa! This entry was posted in Sevilla 2017, Spain, World Travel on April 16, 2018 by ioryallison3.